Kiddy are quickly establishing their place in the UK market, with more and more parents discovering this German brand and realising the superior products that they have to offer. 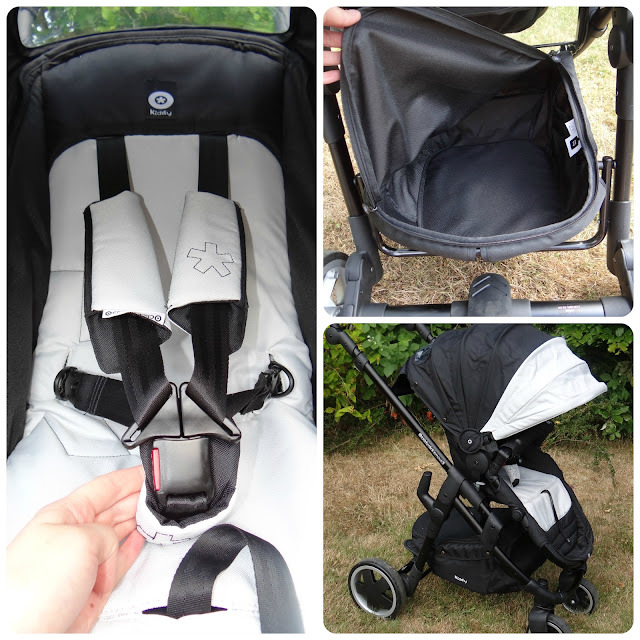 Kiddy are one of the most popular manufacturers of car seats back in their home land of Germany, and I have had the pleasure of trying out two of their products over this year. Back in March I told you all about the Kiddy City n' Move and how much Leo and I enjoyed using this very stylish, easy to use stroller. So when I heard that Kiddy were un-veiling some more exciting products I was really looking forward to seeing the new Kiddy Click n' Move 3, when I went along to the Birmingham Baby Show Kiddy were one of the first brands I tracked down. The Kiddy Click n' Move 3 is an all round pushchair that can be used from the word go when combined with a Kiddy Evolution Pro Car Seat or Kiddy Click n' Move 3 Carry Cot. The pushchair unit it's self is suitable from 6 months plus, but it is great that all bases are covered so you can choose this as your pushchair for your newborn while getting a complete travel system at the same time. I have been sent The Click n' Move 3 to try out with Leo, and over the past few months that is exactly what we have been doing. I had been highly anticipating the arrival of this pushchair, and was really looking forward to seeing how my expectations were going to live up to the reality. The pushchair arrived safely all tucked away in it's box, so my first task was to get everything un-packed and get it all set up. 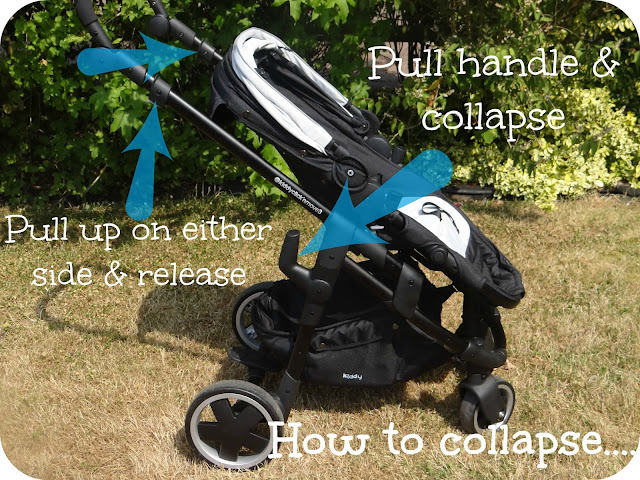 Over the course of 2 years I have had plenty of practice in putting pushchairs together, and I am pleased to report that the Click n' Move is really simple to get up and running. You have everything you need in the box to get you started. I found the initial assembly of the Click n' Move really straight forward and only glanced at the instructions a few times. The wheels simply click into position and the seat clicks straight onto the frame. The part I found tricky and continued to find tricky until recently is the actual putting up and down of the pushchair. I have watched countless YouTube videos on how to do it, but I couldn't put what I had seen into practice. What I was struggling with was the technique, but I have finally cracked it. The Click n' Move 3 has been designed to be a straightforward pain free method to put up and put down, I will demonstrate this a little later in the review. Even with my initial struggles to get it up, within 10 minutes I had the Click n' Move all ready to take out on it's first walk. So I have taken the Click n' Move 3 out of the box and it is now set up in front of me. 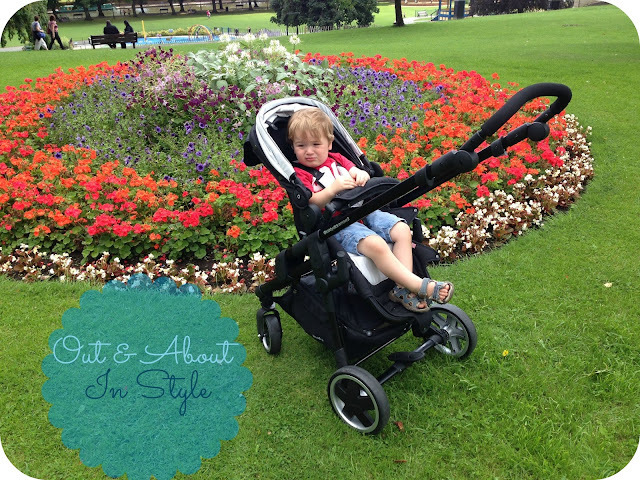 We chose the Stone colourway for this pushchair and I have to say just how smart it looks. It sports a black frame, cream hood and seat lining. I love how the seat unit simply clicks on and off the frame so that you can very easily turn it around to parent facing/outward facing with complete and utter ease. I really like how big the hood is, it is one of the biggest hoods I have ever come across on a pushchair and offers a great source of protection from the elements. Now I may have actually got a little excited about this next bit. A lovely spacious basket complete with a zip to keep all of those items stored away safe and sound. In terms of the actual pushchair I was really impressed with just how light it was once assembled, and how smooth it is to push around. Even with a feisty 2 year old in, it moved smoothly. The brake is perfectly accessible and just requires a push up or down with your foot in order to apply or dis-engage the break. The recline is absolutely super on this pushchair and reclines completely flat with a means of the metal bar at the back of the pushchair. Now for the handle bar... Luke has always complained about the height of my pushchairs handle bars. Apparently they just haven't been built with 'Dad's' in mind. This statement cannot be applied to the Click n' Move 3, the handle bar is fully adjustable and ranges from 84cm to 118cm. It really is perfect for taller parents, and as the handle bar can be adjusted you can cater for both parties who will be using the pushchair. 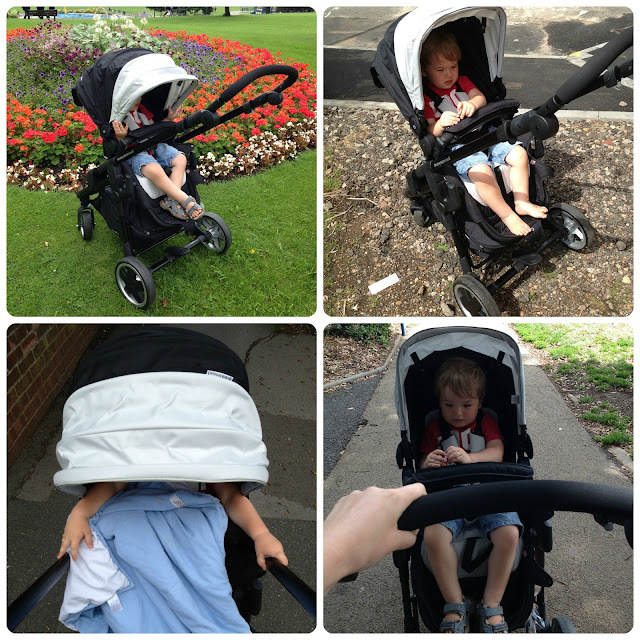 We have been using the Click n' Move 3 in a variety of different scenarios, I am confident that we have experienced different terrains, times where I have had to fold the pushchair up in order to store it away in the car. We have been out and about in the park, smoothly cruised around the town, bumped over un-even ground and hopped on and off a few trains. I have snapped up the chance to have Leo facing me again and we have been having some chats about things we see when we are out and about, we have been along to the river and fed the ducks and even had to make a quick get away when the Geese got a little to greedy! What is really great is that I can change the seating position to either parent/outward facing in a few short moments. If Leo tires of my chit chat and wants to look out at the world around him, then all I have to do is get him out of the seat, push in the two buttons on either side of the frame and simply pull the seat off, before turning it around and clicking it back on. The handle bar on the Click n' Move 3 is such a great height and so easy to adjust by simply clicking in the buttons at either end of the bar. Although I am not tall I have been using the highest handle bar setting, I just find it really comfortable to push around at this level. 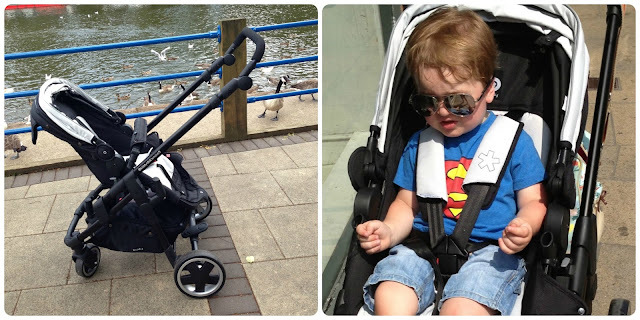 The pushchair is so light even with my hefty 2 year old at the helm of the seat, I have found with other pushchairs that he is really starting to weigh them down, but this is not the case with the Click n Move 3. I can even push this pushchair around one handed, while taking a sneaky munch on a chocolate bar that I just couldn't possibly bring myself to share with Leo... Of course this only works when he isn't in parent facing mode. A feature that both Leo and I have loved is the peek a boo window in the back of the seat unit. Leo discovered this on the very first occasion that he was sat in the Kiddy, and he looked up out of the plastic window at me and said 'Boo Mumma'. So every time we are out and about in it these days, Leo plays a game of peek-a-boo with me. As I have continued to use this pushchair I have grown to love just how user friendly it is, the brake makes it so easy to simply kick it up or down with your foot. It is so smooth that one flick of your foot with activate or deactivate the brake. The basket is another favourite of my on the Click n' Move 3, I have never had a zipped basked before this but it is such a simple but brilliant asset. When you are on the move with a child, a child who has a lot of bits and pieces that they may need while you are out, sometimes a changing bag isn't enough. Especially if you are going for a long day out, so this basket really is an extension of your changing bag, and you can zip it up to eliminate the chance of items going a stray, and you can hide everything from view. The basket is perfectly accessible in outward facing mode but when turned around in parent facing it becomes quite restricted due to how the seat sits over it. I found that I had to alter the foot rest up in order to get things in and out of the basket when in parent facing mode, as the gaps on either side don't give much maneuvering room. Over all I think the basket is a very generous size, and even allows me to fit in my Pink Lining Changing Bag so I don't have to have anything dangling over my handle bars. The bumper bar on this pushchair is actually hiding away the rain cover, I like how they are making use of space that wouldn't ordinarily get used. The rain cover on my other pushchairs is always found in the bottom of my basket, but Kiddy have taken this into consideration and completely freed up all of the basket space (they must know I like to shop!). 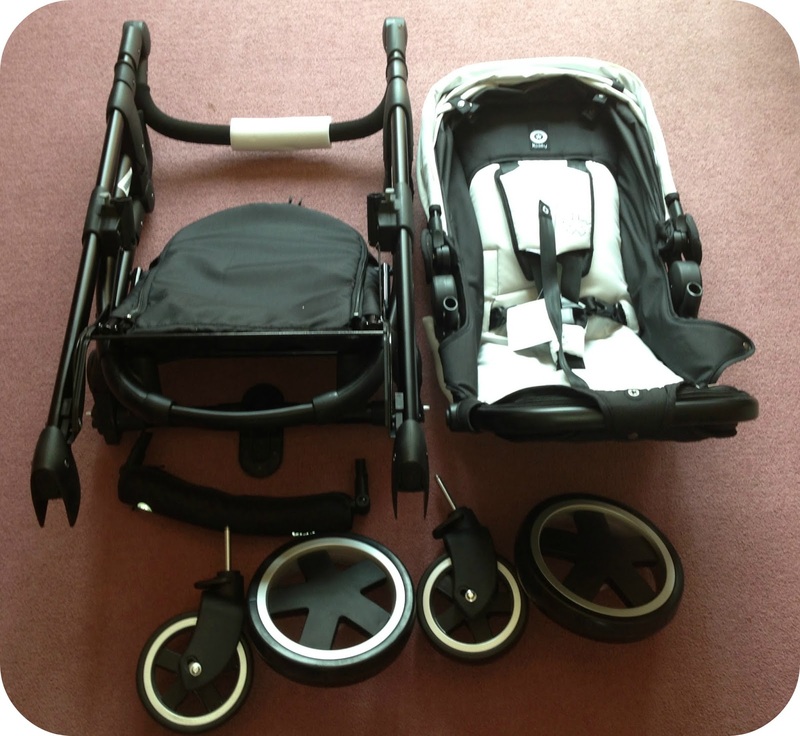 The wheels are all removable which is always handy when you are trying to get the pushchair in and out of the car. I have found the wheels very practical and they have allowed me to go over grassy terrain, cruise around shops and even over uneven gravel, admittedly over the gravel it did struggle a little and I had to put quite a bit of effort in order to get it back onto the desired concrete. For the most part the wheels will let you go wherever you wish to go. As mentioned above, I have found putting this pushchair up and down a little tricky, until recently anyway. It is actually incredibly simple and you just need to get used to the unique fold. I have put together a video to demonstrate the fold and many of the other features of the Click n' Move 3, but for now here is an image showing you what you need to do. The very first thing you need to do is to pull up the release catches on either side of the handle bar, as highlighted in the image. This will recline the handle bar and seat unit somewhat. Once you have done this you need to hold the handle bar and pull it up. This will collapse the pushchair. 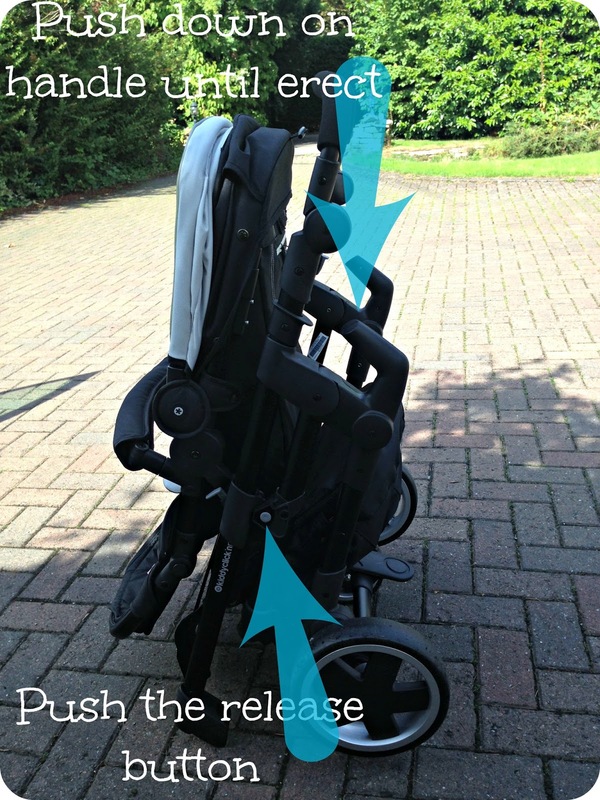 Push the circle button on the Left hand side of the pushchair and push down on the handle. This will pop up your pushchair and you are ready rock and roll. One quibble that I do have with this pushchair is that it doesn't fit in my Peugeot 206 very well at all. The boot is a no go as it is far to big to go inside even with the wheels off. 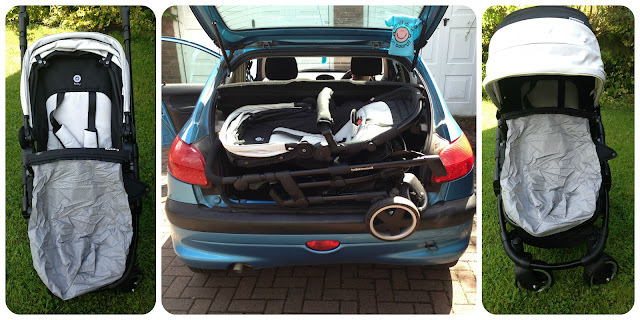 It is the length of the pushchair that seems to let it down when it comes to my little car.. My only option is to squeeze it onto my back seat. Even here it is a real squeeze and I have had to push my seat right forward in order to actually get it into the car. The boot of the 206 is not the most generous in the world of cars, and if you have a bigger car then you really shouldn't have an issue getting it in and out. 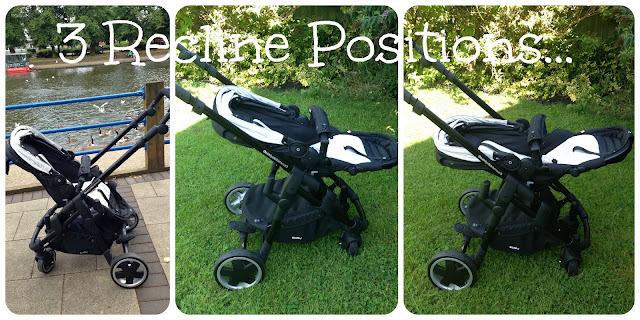 Overall I think this is a really well thought out pushchair, it is sturdy and handles beautifully. Even now with 2 year old Leo he is still sitting absolutely perfectly in the seat and has lots of space to stretch out in. I like how the pushchair spreads Leo's weight out so that it is not heavy to push. I really love the hood and the basket. I do think that when folded the pushchair is rather bulky, and if you are going to be getting it in and out of your car quite often then you may wish to measure it all up to make sure this will be possible. But I do feel happy that out of all of the features with the Click n' Move 3, if my only quibble is fitting it in my car ... Then this is highlighting just how user friendly everything else is. I think that if you were in the market for a travel system that you wanted to see you through until a time where you would no longer need a pushchair, then the Kiddy Click n' Move 3 offers a stylish design with accesseries to make this a very attractive option. You can pick up a Kiddy Click n' Move 3 for £275.00 at Bambino Direct. 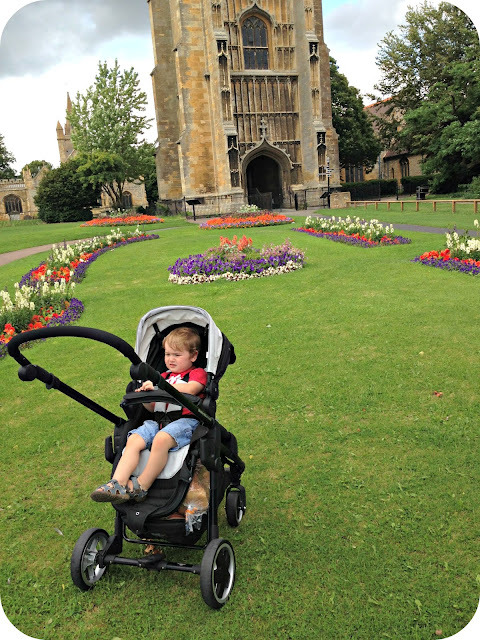 You can then go on to make it a complete travel system by investing in the carry cot for £99.97 and the Kiddy Evolution Pro Infant Carrier for £150.00. I personally think that is a complete bargain for a complete travel system, especially with a pushchair that is set to see you through until you no longer need one. 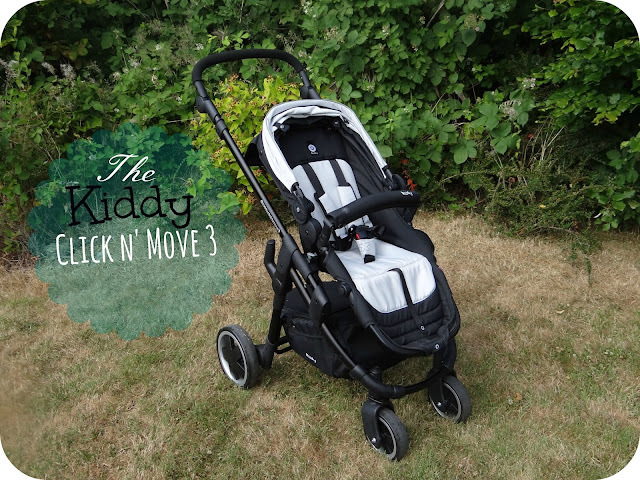 We are big fans of Kiddy in this house and the Click n' Move 3 has been everything and more than we had hoped for. I will leave you with the video that I have put together demonstrating the Click n' Move 3. Disclaimer: I was sent the Kiddy Click n' Move 3 for the purpose of this review. All views and opinions expressed are completely honest and my own. Great review, we love ours too although find the opposite with boot space. My mum has a Polo which won't fit an umbrella stroller in the boot as they are too long, but fits this in! This looks pretty good. Really great review!